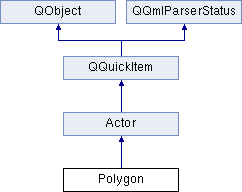 Container Actor for a single PolygonBody. This actor is frequently used to create static terrain and dynamic boulders. Backing physics body for the Actor. Use of a dynamic property alias is necessitated by C++ property definitions lacking dynamic access to properties in subclasses (e.g. "vertices" in PolygonBody::Body).